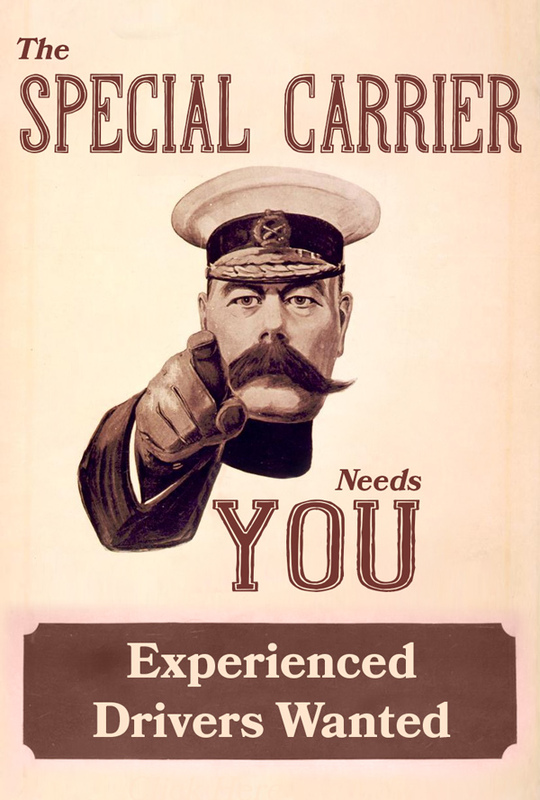 The Special Carrier Limited is looking to recruit new adventurers to join our team of professional voyagers of LGV Class 2 and 7.5T Vehicles . You must possess a valid drivers CPC Qualification card and a drivers Digital Tachograph Card. We are looking to increase our team of professional drivers to fulfil our increasing demand for special dedicated transport to various industries. As a Special Carrier driver you will be driving a range of vehicles from Sprinter vans to 7.5t and 18t trucks from northern Scandinavia biting at the heels of the arctic circle to the warm Mediterranean climate of Istanbul where Europe meets Asia. Our drivers are used to the special nature of what we do: whether it be delivering an entire costume department to a movie set, urgent aircraft parts for a grounded aircraft somewhere in Europe, a lorry load of band equipment for a live event or urgent Motor sport parts required ahead of an upcoming race weekend, either way you will be playing an invaluable part of The Special Carrier team. You will often be required to be away from home overnight or for longer periods and will require a flexible attitude to start times, if its Monday to Friday 9-5 your looking for this isn’t for you as the high demands required, the unstoppable approach and solution providing attitude at The Special Carrier are points we take very seriously and will always go that extra mile to deliver. I’m certain that if you were lucky enough to meet one of our guys on the ferry back to Dover or at a services on the road they would be full of tales of adventure and exciting missions far beyond the mundane crawl of the M25, some may tell of a weeklong trip they have just returned from including working with Roadies behind the scenes for a concert or the great fun they had with a fellow adventurer to Norway travelling over the amazing Øresund bridge into Sweden and making their way up through the fantastic Fjords of Norway, whatever mission they have returned from or are under way to they will speak of the great sense of achievement once completed. If you think you suit this role and can play a part in our team, if you need to break from the mould of hairy arse haulage then download an application form below or email us for your chance to become one of our adventurers! If you need guaranteed regular work with attractive rates of pay, and can drive up to 7.5t and 18t vehicles then this is for you, working a minimum of 16 days a month with additional days if required at extra pay you will enjoy all the above as you become a master adventurer taking on any task from large to small. Need to work on a regular basis but need the choice of when and where then Part time positions or what you seek, all the excitement and adventure of the above but flexible to suit you and us. This position suits you if you’re perhaps semi retired but still fairly active type of person that likes to potter in the garden in the sun but enjoys the opportunity to escape for a little or large if preferred mission into Europe, if its 1 day or 2 days a week or longer you choose. Driver training for CPC ( Certificate of Professional Competence) HAZ-CHEM ADR Training is offered at very competitive rates on site in our training suite. Successfully attaining you CPC Qualification will ensure your able to apply for full, part-time or casual employment. All training is provided in partnership with Hythe Transport Training.